Recently my friend bought some forest and found a 1935 Ford in it, honestly in quite bad shape. Now he is considering restoring it. Nobody blames him if he'll spend a lot of money. Of course it came into my mind if some people are spending a lot of money to bring old cars to shiny condition, then could I spend as well when I am trying to reconstruct a sort of ancient Christianity in its glory on my desktop? Indeed - many hobbies are exceedingly expensive. Its a bonus I think when a hobby directly benefits a ministry and doubly so when that benefits your position in your profession. At this point singleness is a blessing that results in unbridled growth of my library. No one to ask but God, no one elses welfare to consider beyond my own (in terms of finances). If I use these things to better equip me to reach people with the Gospel, then from my perspective there isn't a better way for me to spend my money. Several years back I decided to give up all my other hobbies and invest in Logos. I think I made a good choice. With thousands of books, Bibles, Collection Sets, maps, data sets, dictionaries, commentaries, etc., with no end in sight and many more books to come; is it possible for a “Holy man” or person to become a bookaholic? Can one become addicted to (religious) books? I speak namely of when a person racks up huge debts (borrows/credit), reads all the time, purchase books over food, hardly eats the food available, and don’t sleep for studying and reading. Is this possible? Is this the average Pastor, a seminarian, or an anomaly? No, I am not describing myself-- Just a thought. If this is wrong forum, Oops! Isn't this what everyone does? Why would you spend money on groceries which last only a few days when you can buy books that will last a lifetime? There is no such thing as a bookaholic, just readers and nonreaders. Ok back to my books now. Isn't this what everyone does? No, not everyone. Enjoy your books! That's hilarious. But there's always part of me that dreads becoming Henry Bemis. The personal library of retired John Hopkins University Humanities professor Richard A. Macksey, housed in his home in Maryland, USA. When we were in our previous house one of our smaller book cases was in an alcove next to the fire. One day I realized that it had shrunk a little, the floor joists were giving way underneath it. That certainly is impressive. It also looks a little dangerous. I can imagine that it could be a bit precarious to try to access the higher books. There was a time when I planned on having bookshelves that went from the floor to the ceiling all the way around my office. Now that I have made the switch to electronic books, I cringe to think about having a physical library as large at the one in that picture, let alone having to ever move it from one location to another! even with my logos titles, as long as there wasn't a lot of overlap, I would love to have the library - or even the shelves - from that picture. That would be a tremendous blessing. Maybe for bookaholic is possible. But, as for me this concept is not exactly applicable. Even when I was a student and until now that I'm working. I make sure to get enough sleep, relaxation and eat healthy foods. Is this the world's ULTIMATE library? 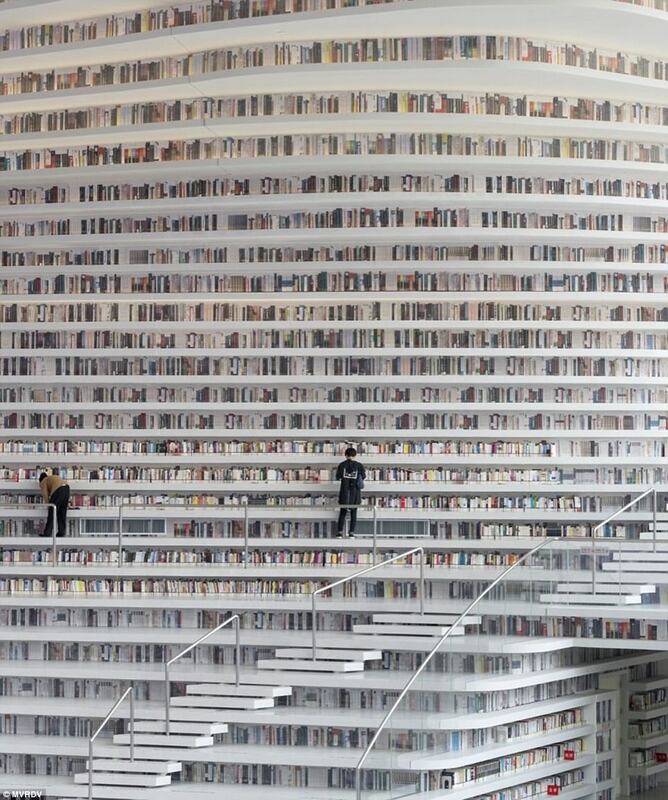 From last November, new library in China. Just wondering what a library of 20,000ish volumes would look like on a wall. We could call it the Leaning Tower of Biblio-Babel Base Package .